Lakshmi - Goddess of wealth. - Hindu Goddess. Lakshmi is a Goddess of wealth prosperity fortune and the embodiment of beauty. 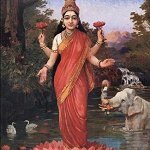 Home ¦ Divinity of the Day ¦ Hindu Gods and Goddesses ¦ Lakshmi - Goddess of wealth. Lakshmi - Goddess of wealth. Lakshmi is a Goddess of wealth, prosperity, fortune, and the embodiment of beauty. She is said to bring good luck and protection from misery and money-related sorrows.